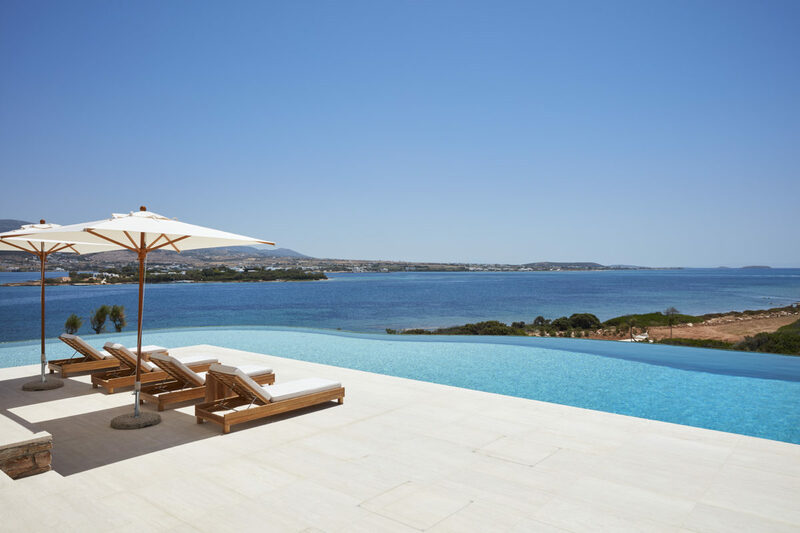 Discover a five-star-resort experience in this jaw-dropping beachfront residence, ready to satisfy the most demanding of tastes and meet the highest of expectations. 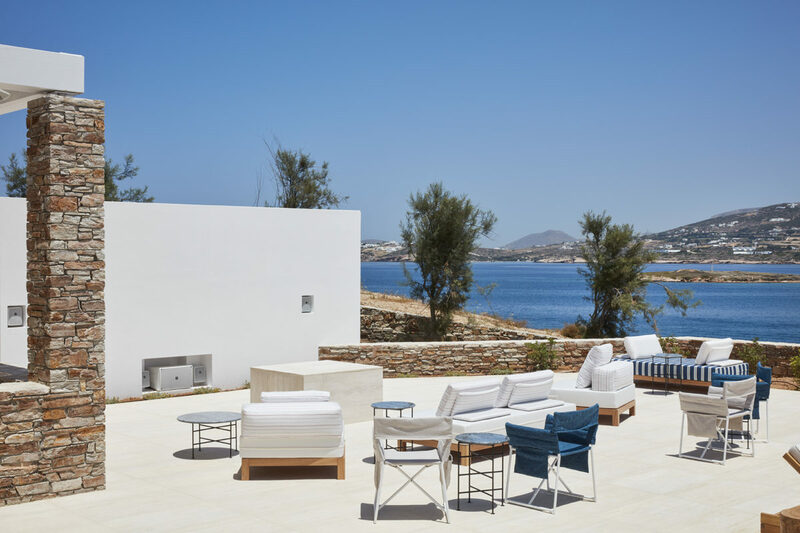 Designed by the most established Greek modernist architect, the property combines sophisticated modernism with Cycladic minimalism and true contemporary leisure. 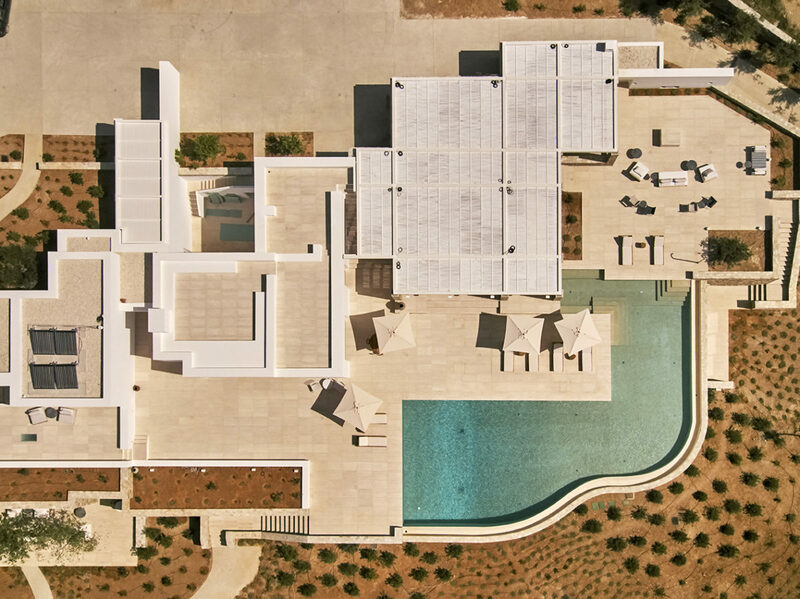 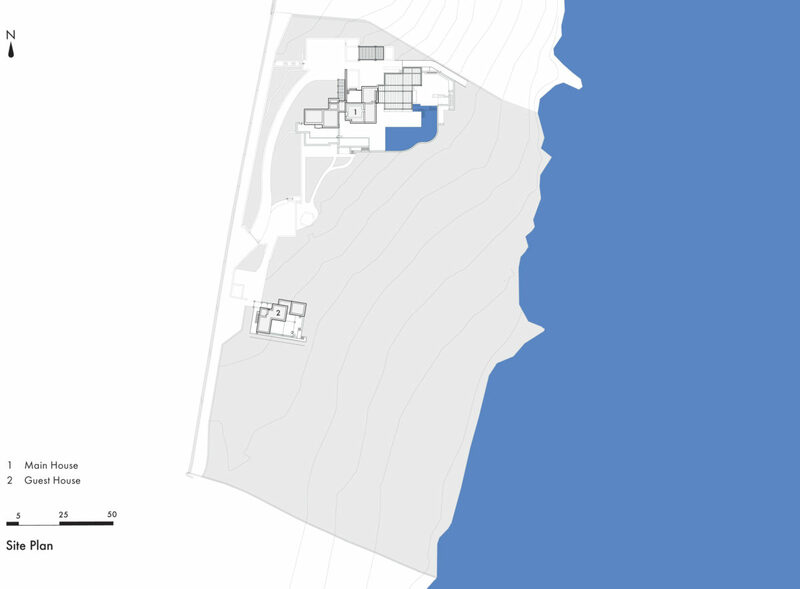 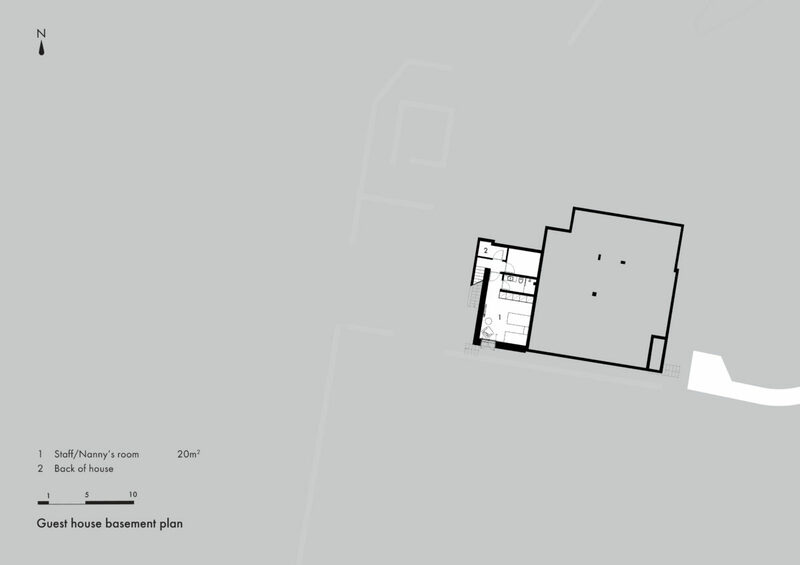 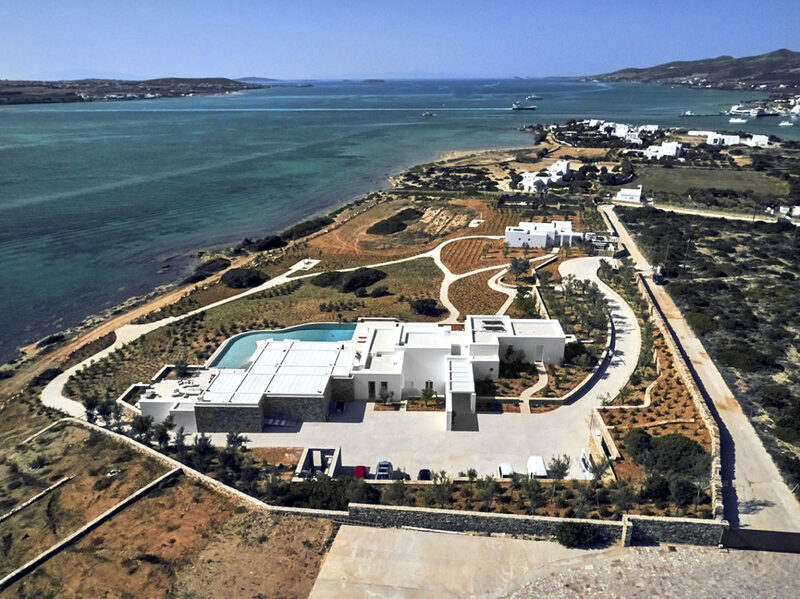 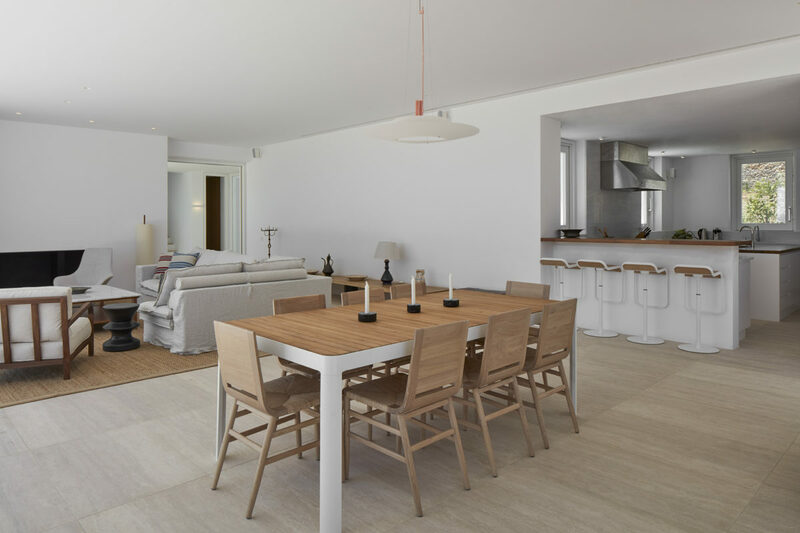 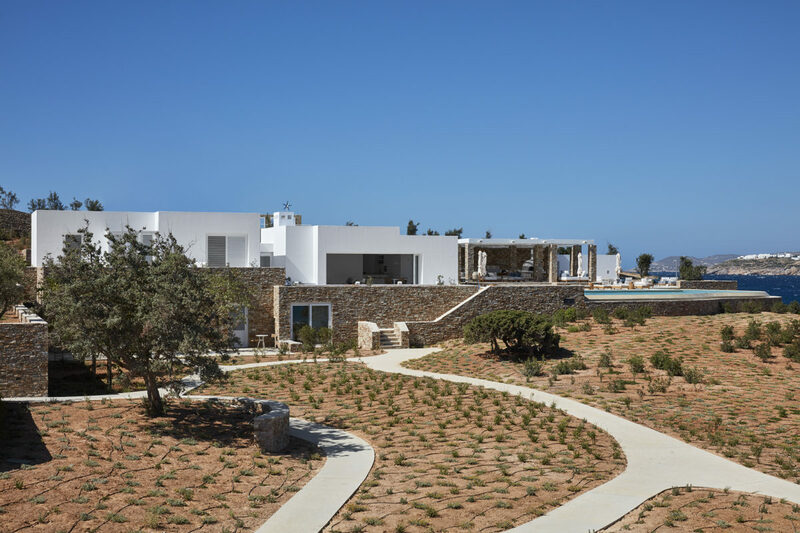 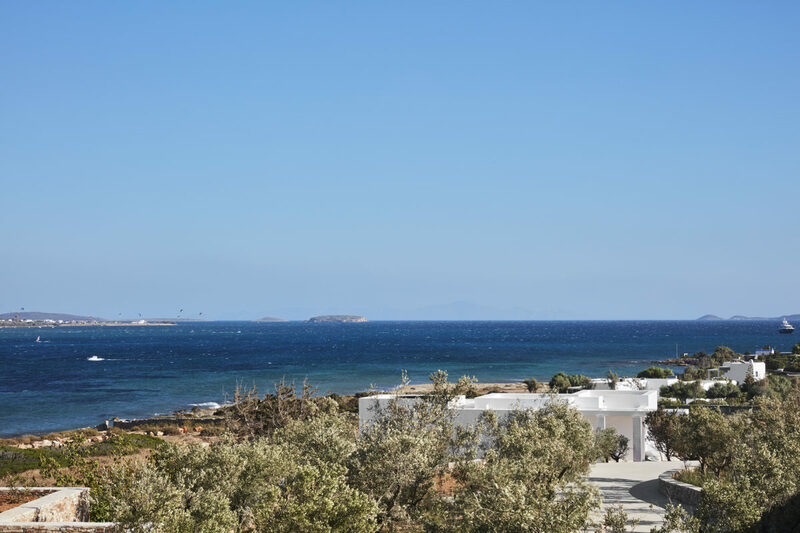 The main four-bedroom villa is built facing south, to ensure that all areas are well-sheltered from the northern winds, and offers privileged sea views of the Paros-Antiparos strait. 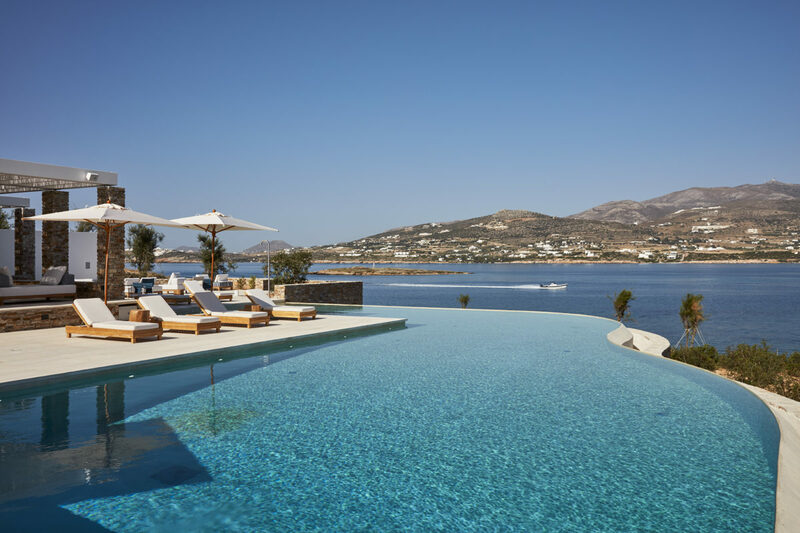 The property’s location is so outstanding that a full range of outdoor activities is at your disposal in the immediate vicinity: snorkeling and fishing on the rocks, hiking and trekking to the nearby juniper forest and the seaside cliffs, and swimming in the turquoise waters that make the northern Antiparos beaches so famous. 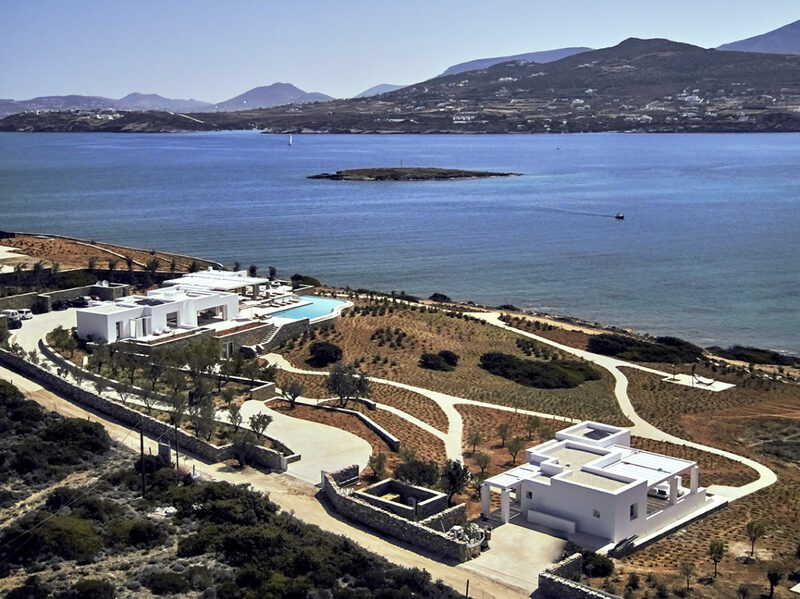 If you don’t feel active, you can enjoy fine vacationing without leaving the property, and swim in the sea right off the house, take a stroll on villa grounds, work out in the gym, take a plunge in the pool or just simply lounge and dine on what is perhaps the most enviable sea-view terrace on the entire island. 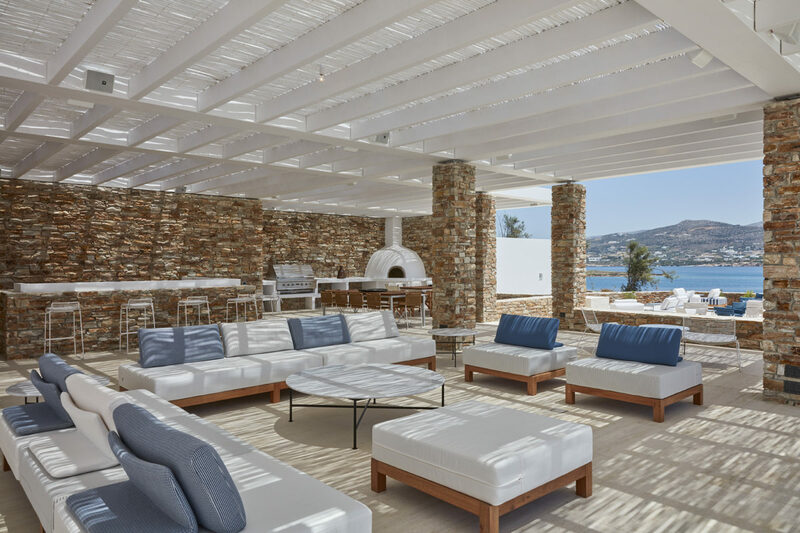 Specially designed for enjoying the Greek summer in true jet-setting style, the villa has sprawling outdoor areas, all with unobstructed sea views and offering different layouts for lounging, dining and entertaining. 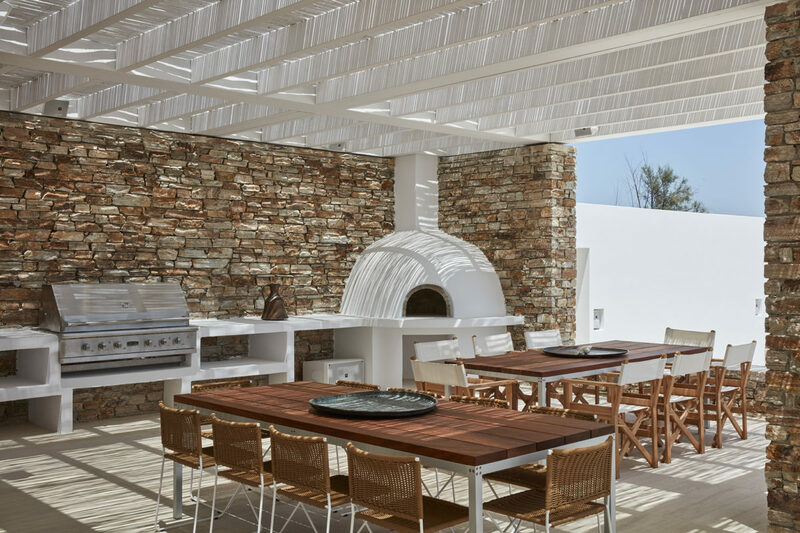 The main outdoor area is near the pool and consists of a covered terrace of 241 square meters with seating areas, verandas, dining area and outdoor kitchen with its own traditional wood oven. 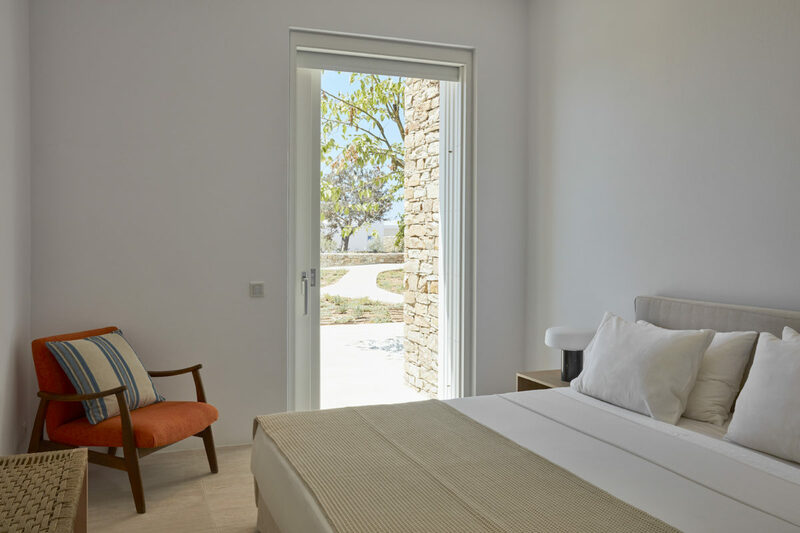 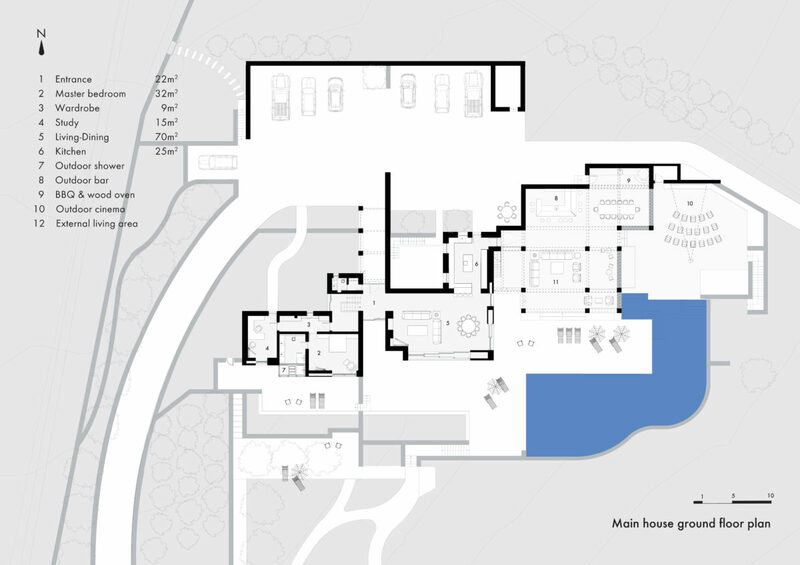 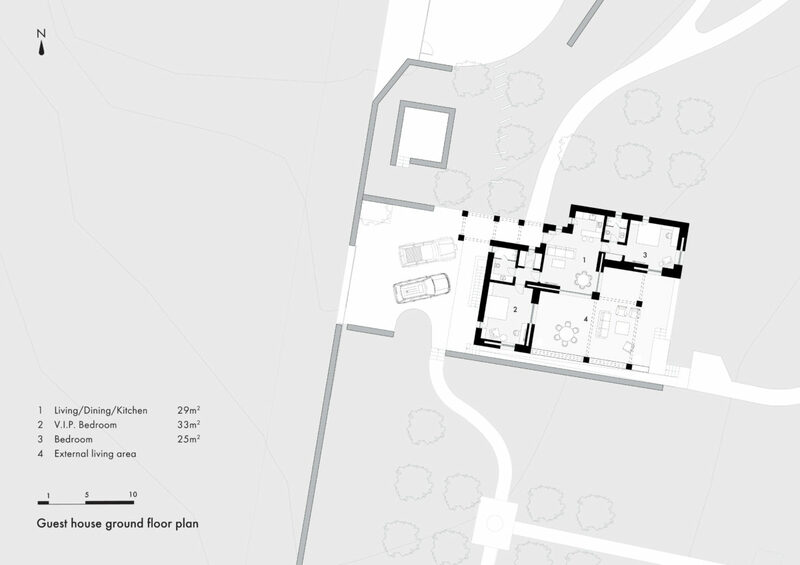 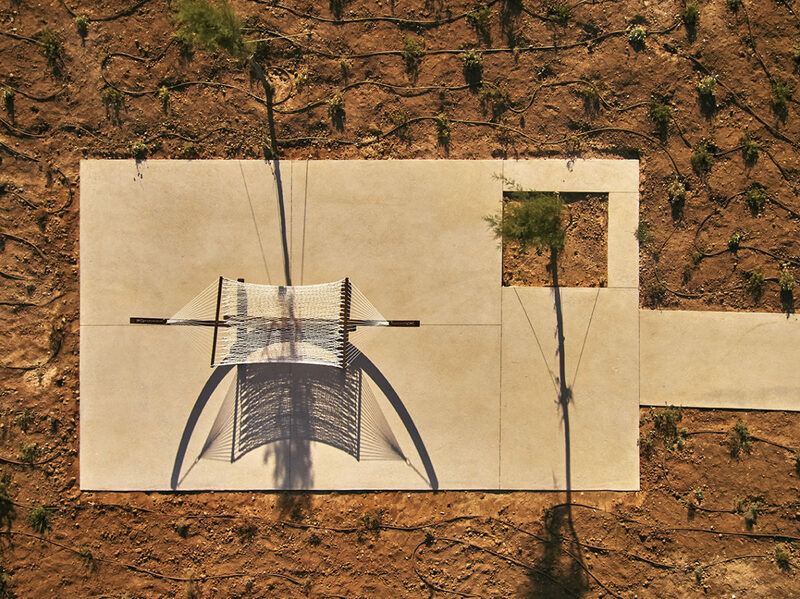 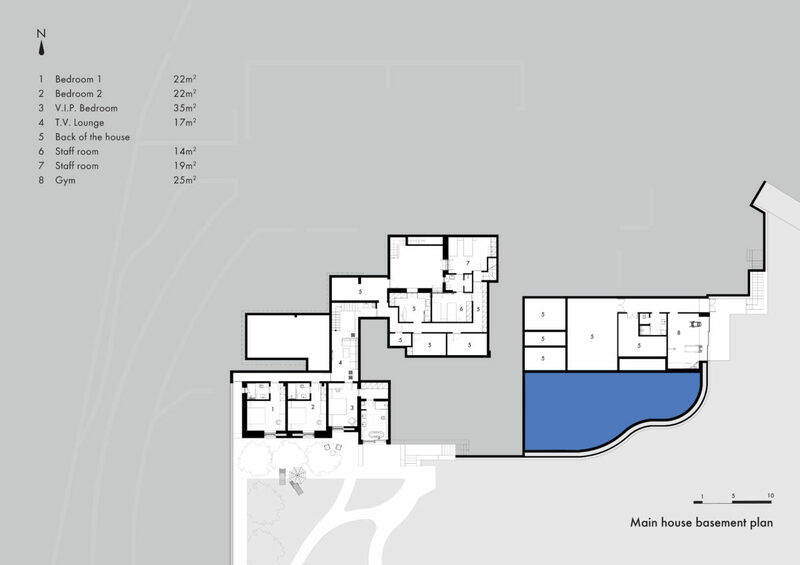 All bedrooms have direct outdoor access, private terraces and connect to main living areas independently from both inside and outside. 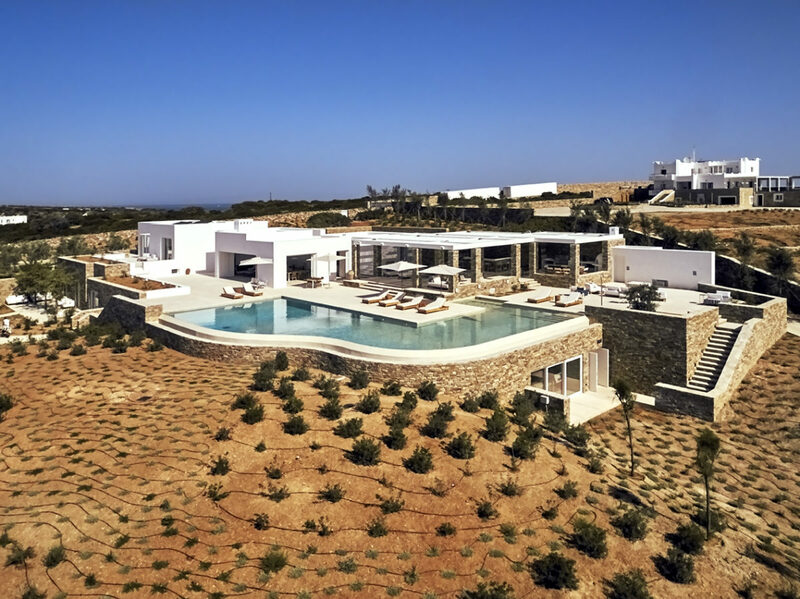 The villa is fully staffed and equipped according to the highest standards, with a well-equipped gym, a state-of-the-art outdoor cinema with Hollywood-class movie projector, and even a vegetable garden with its own table for freshly made, garden-to-plate dining. 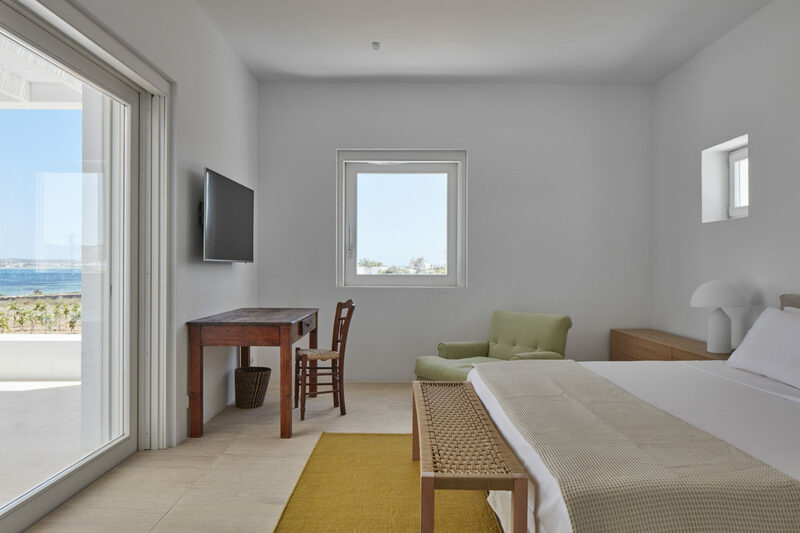 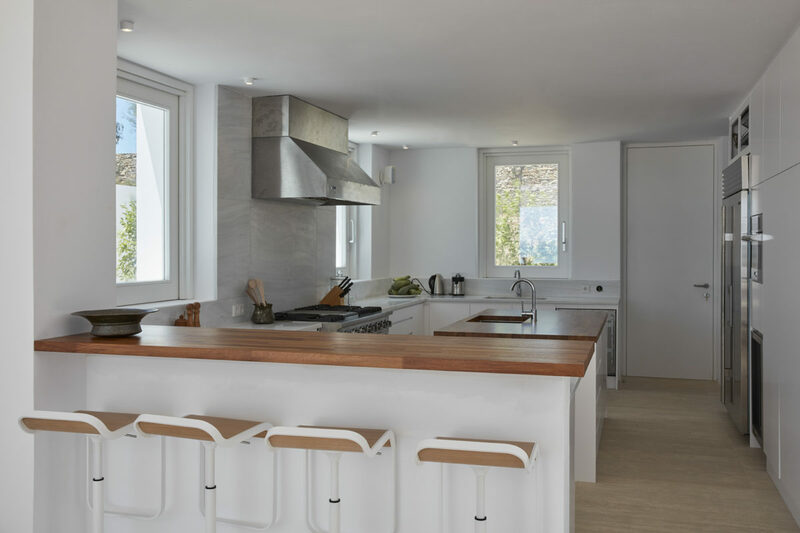 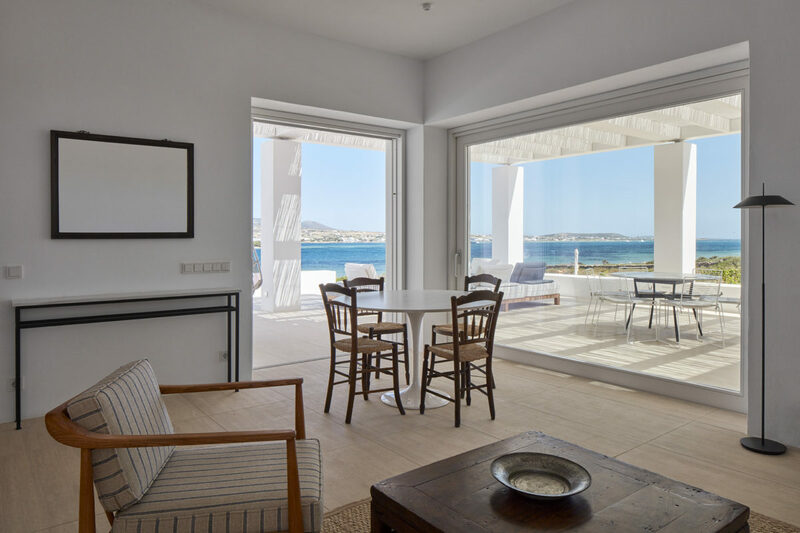 Completely detached from the main villa is a charming whitewashed guesthouse of typical Cycladic geometry and simplicity, with its own terrace, kitchen and independent street access. 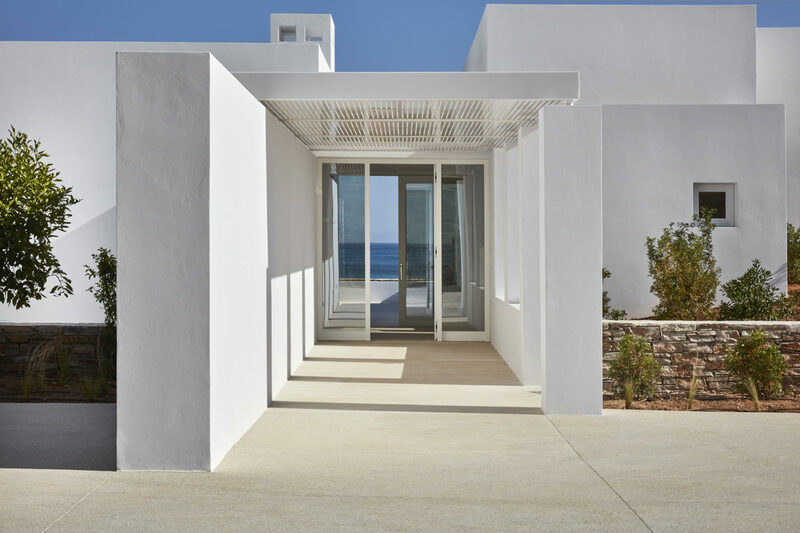 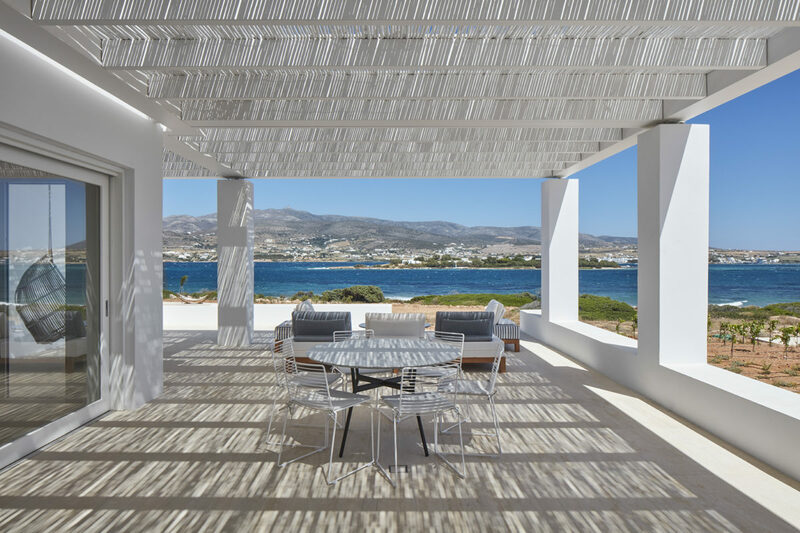 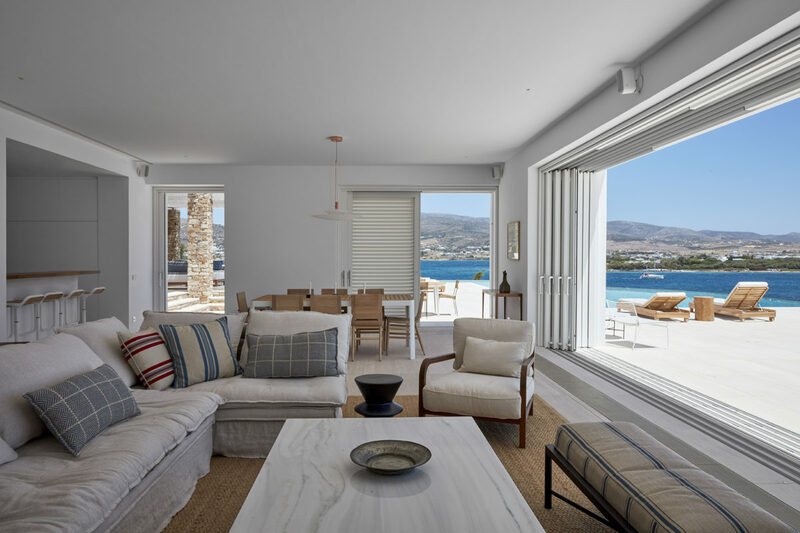 Its main terrace is facing south and east towards Paros, and connects to the interior through large openings that bring the soothing blue of the Aegean inside. 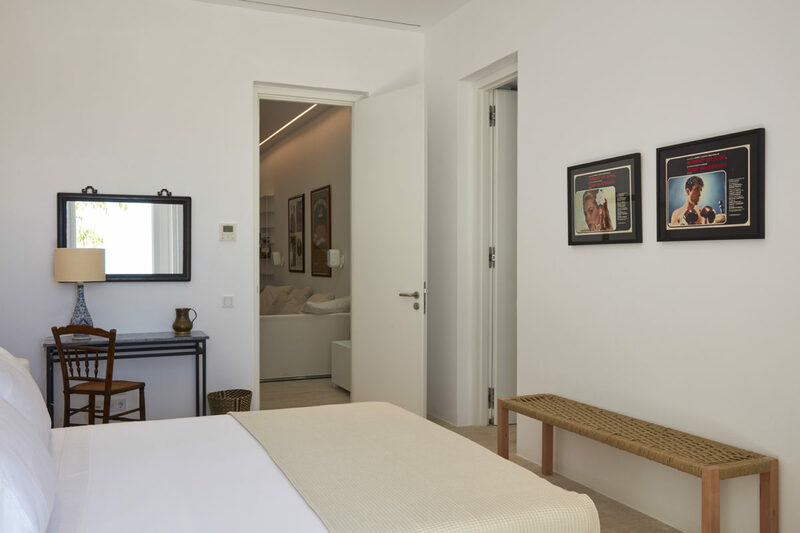 The guesthouse has two bedrooms and bathrooms, and can be rented independently from the main villa, or used as extra housing space for staff and nanny’s room.